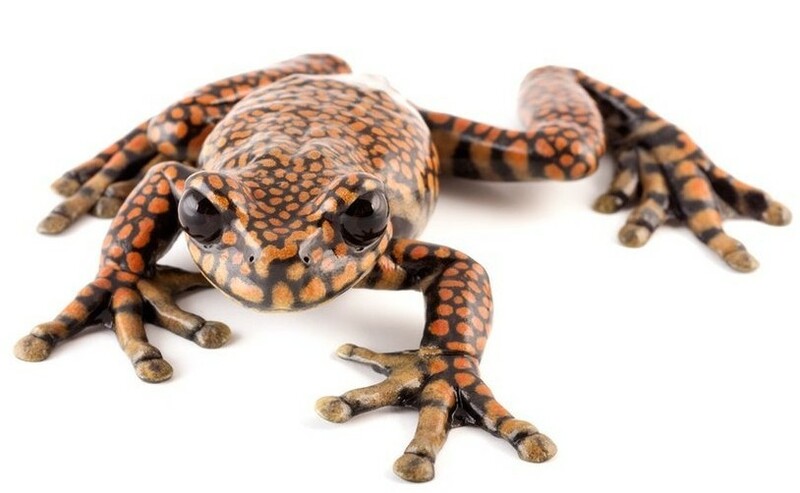 Amphibian Ark recently coordinated a special event to reveal the scientific name of a new Ecuadorian frog named after Charles, Prince of Wales, to honor his remarkable efforts to protect rainforests around the world. The event took place at his Highgrove House on 5 July and included presentation of a commemorative medallion from the Royal Mint, and Frabel Glass Art Studio and Gallery made a glass sculpture of the frog. Hans Godo Frabel came to the US from West Germany in 1965 and founded the Frabel Studio in 1968. His glass art is internationally known and collected by thousands around the world including museums, presidents, royalty, celebrities and art collectors. I became acquainted with Hans Godo Frabel and the Frabel Glass Studio in Atlanta back in about 2007 during an exhibit of their wonderful work in the Fuqua Conservatory at the Atlanta Botanical Garden. See www.frabel.com/news/winter-display-atlanta-botanical-garden After learning more about the conservation work that the Garden was doing with orchids and amphibians, the Frabel team set out to render fantastic, life-size and styled works of some of the endangered frog and orchid species in the collections at the Garden. These were featured in a special exhibit in the Fuqua Conservatory and as their popularity grew, they were made available for purchase with the proceeds going directly into conservation. The program was highly successful and thus, quite helpful to the efforts. The Garden is forever grateful to Frabel’s president Kevin op de Ehze for his efforts without him this collaboration would not have happened. When the idea to honor His Royal Highness Prince Charles with the naming of a magnificent species of frog from Ecuador surfaced, the thought of a Frabel Glass Sculpture was next on my mind to make this potential event even more special. After a great deal of creative work in the studio, the Frabel team produced a stunningly beautiful version of Hyloscirtus princecharlesiPrince Charles Stream Tree Frog which was presented to His Royal Highness on July 5. 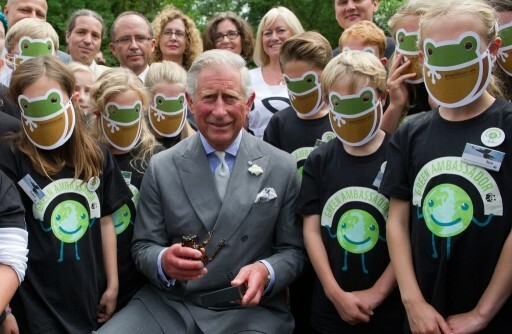 Prince Charles, Prince of Wales poses with a group of school children wearing AArk masks, and an Ecuadorian stream tree frog named in his honor. Amphibians are our most imperiled terrestrial vertebrates, and habitat loss is the greatest threat. Conserving important habitats like rainforests is therefore the single most significant act we can take to protect amphibians. The Prince’s Rainforest Project is at the forefront of these efforts, and HRH’s role will be honored in perpetuity in the Latin name of this precious, newly-discovered species. The spectacular new stream frog was discovered as new to science by Ecuadorian Scientist Dr. Luis A. Coloma in 2008 among preserved museum specimens. Dr. Coloma immediately recognized the specimens as unique, a new species in the hylid genus Hyloscirtus. If this rare species is to persist in the wild, it requires further scientific and conservation action in the field and in the laboratory. Only two juveniles are currently kept in lab conditions. A rare species of Ecuadorian stream frog has been named Hyloscirtus princecharlesi, or Prince Charles Stream Tree Frog. Dr. Coloma, the world-renowned amphibian biologist who discovered the new species and chose to name it in honor of the Prince, was in attendance at the event, as was AArk’s Amphibian Program Director, Dr. Kevin Zippel. Dr. Coloma currently works on amphibian science and conservation and founded Centro Jambatu de Investigación y Conservación de Anfibios, in Quito, Ecuador as part of the Ecuadorian NGO Fundación Otonga. Luis is a proud member of the Amphibian Ark global network, which facilitated the event with the Prince.